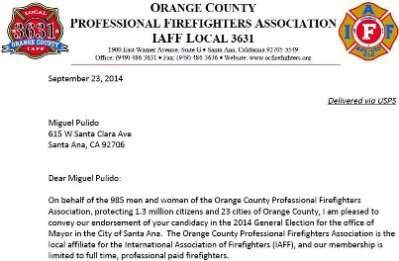 The Orange County Professional Firefighters Association has announced that they are endorsing Santa Ana Mayor Miguel Pulido in this year’s November General Election. This is the second major public safety endorsement that Pulido has picked up this week. He was endorsed yesterday by the Santa Ana Police Officers Association, as we reported. Public safety accounts for over half of the city’s budget. Most residents will agree that making our city safer is their top priority. These associations will typically support their endorsed candidates with precinct walking and campaign mailers so these endorsements are much appreciated by the candidates. Two candidates are running against Pulido in the General Election. First term Councilman Roman Reyna is one of them and resident Mark I. Lopez is the other. 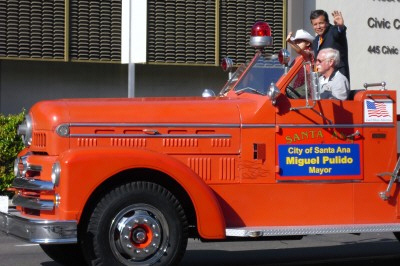 Since he was first elected to the Santa Ana City Council in 1986, Mayor Miguel Pulido has been a major force in the renaissance and economic revitalization of the City. He is currently serving his sixth term as Mayor and has proven to be a leader, not only within the community, but regionally and nationally. Mayor Pulido has focused his efforts on improving the quality of life for all Santa Ana residents. During his tenure the City has experienced a 58 percent reduction in crime, an increase in home values, a rise in the number of business licenses, an enhancement of the economic opportunities for the private sector, an overall revitalization of the City’s infrastructure and an expansion in social and culture venues. Click here to read the rest of Mayor Pulido’s bio. Another sign that he is the ONLY candidate capable of leading the city forward. When are the voters going to come to the realization that candidates who are endorsed by public employees unions are bought and paid for shills. We live in a city dominated by Democrats. They are pro labor so these endorsements matter.